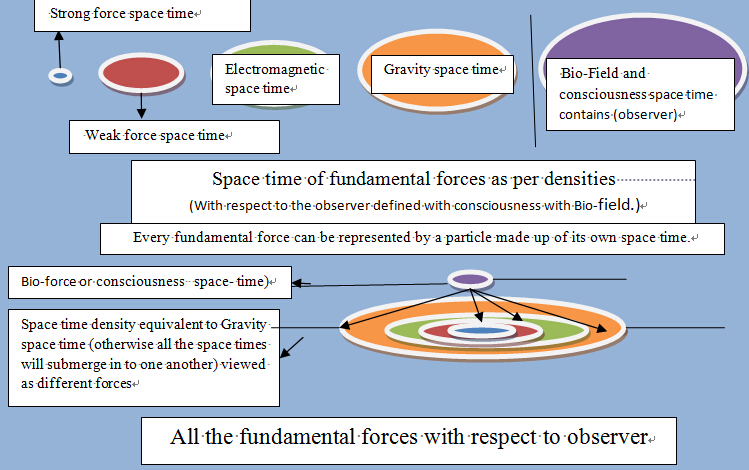 Interpretation of Bio-force and other four fundamental forces of nature in the form of space time-New approach for Grand Unification Theory of physics. Application may motivate technologies like ‘Humanoid Robotics’, ‘Bio-photonics’, and ‘Neuroscience’. In a recent paper by author S P Kodukula, a new model of Grand Unification concept was suggested. The paper has emphasized the role of observer in Grand Unification by considering biological force as the fifth fundamental force in addition to other four fundamental forces-Gravity, Electromagnetic, weak and strong forces. According to him consciousness or bio interactions exhibited by all the living things can be expressed in terms of physical concepts tune with the space time principles and general relativity equations. All the space time content for all the forces are same. Only the density will be different. Further S P Kodukula expressed that due to variation in densities the space times (if we consider space-time as a four-dimensional fluid, will submerge in to one another according to their densities. The electromagnetic space time submerge in to gravity space time , weak space time in to electromagnetic space time, strong force in to weak force etc.. But all the forces will be observed by observer at this four dimensional space time(all observers defined for same space and time and follows local physical laws). Particles are made up of their concerned space times for observer they exhibit different forces of nature in this four dimensional space time. S P Kodukula specified that the theory is different with the ‘String theory’ and other ‘quantum field theories’. As per existing field theories, the particles are exited states of fields. Exited states of fields can represent any number of particles. Fields are continuous quantities over space. There exist excited states with arbitrarily large numbers of particles in them. Considered the space as one that was associated to our four dimensional space time. A Gauge theory developed by change in time where as space is unchanged. Even in string theory also strings propagate through space and interact with each other. On distance scales larger than the string scale, a string looks just like an ordinary particle, with its properties like mass, charge etc determined by the vibration state of the string. Here also the same space has been considered for all forces. This new concept specifically says that whatever may be the dimensions of space time(like M-theory) ,the universe must be confined to our four dimensional space time described in General Relativity only. The excess dimensions of space or time will produce effects like new forces or fields. Complete universe can be interpreted by the physics limited to our four dimensional universe confined to our consciousness. The other imaginary or speculative results excess to this four dimensional universe must be verified as a part of physical universe as various forms of energy differentiated and measurable by physics. Even a multiverse idea which elaborates that there exist several universes is also not accepted by physics defined by us unless otherwise the definition of signal velocity and symmetry has been changed. This new grand unification idea says that maximum signal velocity is defined for various space times just like light to our space time. All other space times must be transferred to our space time for which light velocity is maximum. If any other space times as mentioned in multiverse idea exist, they must follow symmetry. So, if we follow special theory of Relativity, we have to avoid multiverse idea. If we believe multiverse idea is right, we have to deny special theory of relativity. The author firmly believes the physical significance of special theory of relativity. Whereas this new theory of Grand unification says that a string generated is a wave in space time. But the space time is not the same for all the particles. The space time will vary for all four (with bio-field five) fundamental forces and the wave generated in that space time is that force carrying particle. Thus the wave is the disturbance created in that space time only. But for an observer it is coming out as another force in gravity space time and generates corresponding gravity wave also for propagation in gravity space time. Finally Siva Kodukula says that this direction of thought may lead to substantiate the concept of consciousness and bio-force in terms of theoretical physics. This substantiation brings a technological revolution by trying to make humanoids with consciousness and artificial intelligence. The idea has been supported by a paper by the same author ‘Emission of Bio-photons is Cosmic Effect’. The concept of Grand Unification of Bio-force with other four forces of nature will substantiate it further within the frame work of physics and make a path way for the new generation thinkers, physicists, neuroscientists and researchers working on humanoids and robotics.